Fans of late singer Chris Cornell, best known for his works for rock bands Soundgarden and Audioslave, want the black hole named after him. Photo by @ehtelescope | Twitter. Humanity took a big leap towards knowing the universe a little better last week after the first-ever image of the black hole was released. And now humans want to name it after late singer Chris Cornell. The telescope was an achievement in itself. Named Event Horizon Telescope - a network of eight radio telescopes stationed at different points of the world - creating a virtual Earth-sized telescope. Katie Bouman, an MIT graduate and a scientist, then developed an imaging algorithm to piece together the data collected over the years to give us one single photograph of the black hole. But why not name it? Turns out, Black Hole already has a Hawaiian name — "Powehi" given by University of Hawaii-Hilo Hawaiian Professor Larry Kimura. If you're wondering, Powehi means "the adorned fathomless dark creation" or "embellished dark source of unending creation" comes from the Kumulipo, an 18th-century Hawaiian creation chant. Because 2 of the 8 radio telescopes used in the project were located in Hawaii, astronomers said. 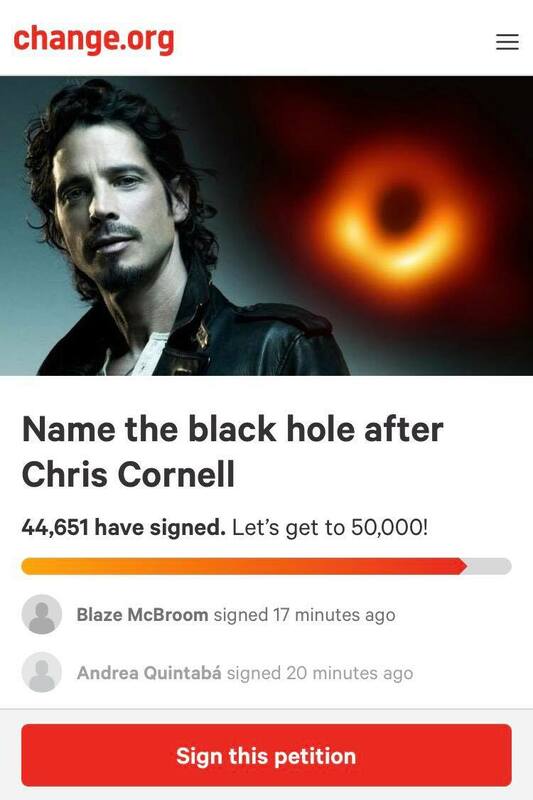 And now the fans of Chris Cornell want to change it after the late singer and musician. Chris, who was the lead singer for rock bands Soundgarden and Audioslave, passed a couple of years ago. In order to pay their respect to the departed, a fan of the late rockstar has started an online petition to get the name changed from Powehi to something that reminds fans of Chris Cornell. Created by Giuliana Jarrin, the petition already has over 44K supporters, at the time of writing this. "Almost two years ago, we lost Chris Cornell. He was the lead singer for Soundgarden and Audioslave, and above all, the voice of an entire generation. He was one of the most beloved figures not just in rock, but all of music, by people from all over the world," wrote Giuliana in her petition. "Black Hole Sun", written by Chris Cornell is without a doubt Soundgarden's most recognizable and most popular song, and one of the biggest anthems of the 90's. For this reason, and the impact Chris Cornell had in the lives of so many and music itself, I ask NASA, the Event Horizon Telescope Collaboration and all the astronomers and scientists involved in this discovery, to name this black hole after Chris Cornell. This would be a "surreal" and amazing way to honor his life and his contribution to music."